You’ve probably noticed the word share being used a lot on Facebook. Practically every time you’re posting something, you’re clicking a Share button. Sharing from the timeline is no different. In addition to the Share menu at the top of your News Feed and timeline, Facebook has a specific Share feature, designed to make it easy to post and send content that you find both on Facebook and on the web. If you’re looking at content on Facebook that you want to show someone, simply click the Share link near it. This opens the Share box. On your own timeline: This option posts the content to your timeline the same way you would post a link or a photo from your Share menu. This means it will go into your friends’ News Feeds as well. On a friend’s timeline: This option is the same as copying and pasting a link into a timeline post you leave on your friend’s timeline (but it’s much easier than all that copy/paste nonsense). In a group: This option allows you to post the content to a group you are a member of. On your Page (for Page owners only): If you are the admin of a Page, you can share things as a post from your Page. In a private Message: This accomplishes the same thing as copying and pasting a link into a message to a friend. In other words, only the friend you send it to will see the link, whereas sharing via the timeline means anyone viewing your friend’s timeline can also see the link. 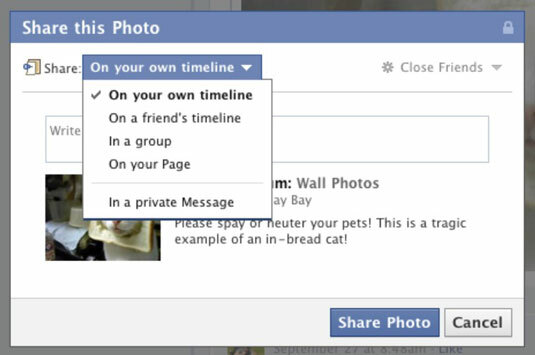 If you are choosing to share on your own timeline, you can click the drop-down menu to set privacy on the post. After you’ve chosen how you want to share the item, you can write something about what you’re sharing. If you are sharing an article, you can edit the preview that appears in the post. The Share box shows you the preview, and you can hover over the headline and teaser text to highlight them. Click the highlighted text to begin editing the preview. You can also choose a thumbnail to accompany most shared links. Use the arrow keys next to the words Choose a Thumbnail to see your options. If you don’t like any of them, check the No Thumbnail box. If you click Share on a friend’s post, the friend who originally shared it is given a credit. So if you reshare an article, the post that your friends see will say Via [Friend’s Name] so that everyone knows where you found it.